Champagne, jewelry, good friends aaaand roasted potatoes..need I say more?!?!? As I mentioned in yesterday's post, this past weekend I hosted a Stella and Dot Trunk Show for my coworkers and friends. I have loved Stella and Dot jewelry for a while now and usually just order it through a close friend who sells the trendy, well made jewelry. After learning that another friend of mine, the guidance counselor at my school, also was a Stella and Dot stylist, we thought it would be fun to host a trunk show for all of our friends at work...and it was! If you are interested in hosting a trunk show, here are my favorite stylists! We gathered together this past Saturday morning at my house and had the best time. We rarely have time to just be together and it was marvelous - there was no "work talk", just hanging out and catching up with each other on a personal level. Cristina brought her gorgeous samples and we sipped on mimosas and sangria. The perfect start to a Saturday if you ask me! I am a trunk show rookie, as I have never hosted one before and I have to tell you - they are not only so.much.fun, but they also come with great rewards! Because everybody at the party placed an order I have so many rewards waiting on me to cash in! The best part is that if you couldn't make the party in person, you can go online and place an order. My trunk show orders are available until March 5. Click here if you are interested in treating yourself to something sparkly! The menu wasn't too shabby either. We feasted on two different types of quiche - cheese and bacon along with a red pepper, mushroom and cheese selection. We also had fruit salad, yogurt with granola and the star of the show...the roasted potatoes! 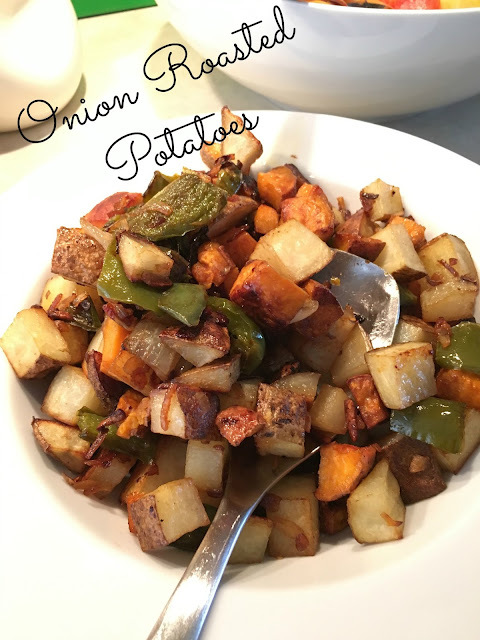 I have to say, I was pretty impressed with how they turned out since I tried a few new additions to my normal, everyday roasted potato recipe. Usually, I just use baking potatoes with oil and dry onion soup mix as the seasoning. Well, this time I added sweet potatoes, green peppers and onions to the mix and it was DELISH. Everybody raved about the recipe and didn't believe me when they heard how easy it was. See for yourself! Preheat oven to 400 degrees. In a large bowl or plastic bag add all ingredients. Close bag and shake, or mix with hands in a bowl, until ingredients are evenly coated. Empty potatoes and veggies onto a foil lined baking pan sprayed with non stick spray. Bake, stirring occasionally for 40 minutes or until potatoes are tender and golden brown. They should have a nice crust on the bottom side. Serve warm. *I doubled this recipe for the party to serve 8-10 people. I would use this as a side for any number of dishes; breakfast, lunch or dinner, and consider it a go-to for a crowd. Enjoy!